Be the first to share your favorite memory, photo or story of Cloyce. This memorial page is dedicated for family, friends and future generations to celebrate the life of their loved one. 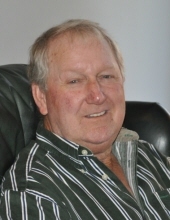 Black Rock – On Friday, February 1, 2019, Cloyce Gene Burrow, loving husband and father of three children passed away at the age of 69. Cloyce was born on May 29, 1949 in Imboden, AR to Cebe and Ruth Burrow. After graduating from Sloan-Hendrix High School in 1967, he volunteered to serve in the U.S. Army for four years in the Vietnam War. Cloyce was a recipient of the Combat Infantry Badge, Army Commendation Medal, and Purple Heart. He married his wife Snow Ann, the love of his life, on January 6, 1973. In 1973, Cloyce and Snow Ann moved to Illinois where he worked on the towboats as a deckhand, he obtained his pilot’s license in 1979, while simultaneously earning a degree in Finance from Lewis University. From there he went on to help form Ham Tug Towing and then Burrow Barge Cleaning and Repair. In 1995, they moved back to Arkansas, which was always home for them. For 23 years, he also owned and operated a cattle farm, and then retired in 2018. He was preceded in death by his parents, his sister; Lorna Hackworth and brother in law and former business partner Cecil “Cap’n Hack” Hackworth. He is survived by his beautiful wife Snow Ann, three children Tara (Carl) Todd of Imboden, Brenna (Jeremy) Jones of Jonesboro, and Justin (Jenny) Burrow of Strawberry. He has six grandchildren, Faith Sharp and Jacob Todd of Imboden, Jana and Tate Jones of Jonesboro, and Kaden and Libby Burrow of Strawberry. He has two surviving siblings, Joyce (Harry) Huss of Pekin, IL and Troy Burrow of Pocahontas. He also has several nieces, nephews, and many beloved friends. Visitation will be held at McNabb Funeral Home on Monday, February 4 from 5-8 PM and funeral service on Tuesday, February 5 at 2 PM with Cloyce’s brother in law, Dennis Smith, officiating. Interment will be in Oak Forest Cemetery in Black Rock. Pallbearers include: Justin Burrow, Jonathan Mitchell, Carl Todd, Jeremy Jones, Wendell Hackworth, and Chuck Colognese. Honorary Pallbearers include: Troy Burrow, Steve Breese, Jim Stein, Jeanne Murray, Danny Huss, David Huss, Johnny Hamm, Charlie Seagraves, Danny Mitchell, Jim Pinkus, Elijah Smith, Enoch Smith, and Shiloh Lenox. In lieu of flowers, memorials may be made to Five Rivers Animal Aid, PO Box 404, Pocahontas, AR 72455. "Email Address" would like to share the life celebration of Cloyce Gene Burrow - McNabb Funeral Home. Click on the "link" to go to share a favorite memory or leave a condolence message for the family.